On Monday night Feb. 27, the Mérida carnival was a regional sample of Yucatecan culture. The colorful carnival costumes, outfits and masks were left behind for one night to give way to the modern mestizas and elegant gentlemen who wore their best typical Yucatecan attire along the four kilometers of the route in the Plaza Carnival of Merida. It is a different party and it is done preserve the roots of culture in Yucatan, like its music. Unlike the other days, Monday was in typical costume, the men in guayaberas and white pants, the women in their dresses called huipiles, with multicolored embroidery and adorned with jewelry. All in white, mestizos and mestizas distributed in 76 comparsas, performed their best choreographies to the rhythm of traditional dances such as jaranas and trova. 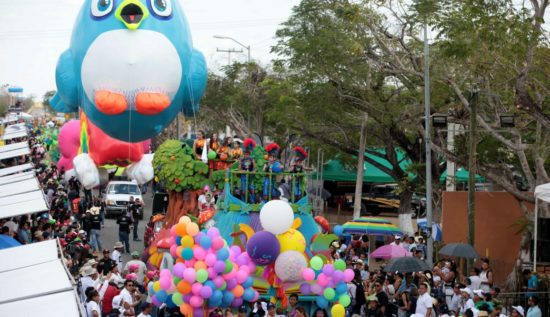 21 floats and giant balloons, works of 20 indigenous Mayan craftsmen, were also part of the parade. More than 35 thousand people have enjoyed the party in 6 days. 20 towers with surveillance cameras, seven first-aid modules and 1,140 state and municipal elements, were in charge of security.